Have you been suffering from stress lately? Feeling exhausted, irritable? Losing sleep? Kids declared a jihad on school? It could be you’re suffering Wind Turbine Syndrome, according to the Waubra Foundation. Symptoms claimed include sleep problems, headaches, dizziness, nausea, exhaustion, anxiety, anger, irritability, depression, tinnitus, concentration problems – and a new one – children refusing to go to school! WHO IS THE WAUBRA FOUNDATION? The Foundation’s “medical director”, Sarah Laurie – a non-practicing, unregistered doctor – claims ‘infrasound’ from wind turbines is the culprit. A quick straw poll of my neighbours returned a “yes” to almost all of these. Unless there is a secret wind farm in the leafy environs of one of Melbourne’s riverside inner suburbs, I’d have to agree with Simon Chapman, Professor of Public Health at the University of Sydney. These symptoms are experienced by millions of Australians. I was alerted to the extraordinary claims made by the Waubra Foundation by a friend some months ago. A check on its Board members revealed that the Foundation was, not surprisingly, a front for the “Landscape Guardians” a powerful, well resourced and rapidly expanding anti-wind astroturf (phony grassroot) group. They model themselves on their successful older UK cousin, the nuclear-funded Country Guardians. Peter Mitchell, Founder and Chair of the Waubra Foundation helped set up and fund the Australian Landscape Guardians and is also spokesman for the Western Plains Landscape Guardians. A second Director, Kathy Russell, is Vice President of the Australian Landscape Guardians, Vice President of the Victorian Landscape Guardians, spokeswoman for the Western Plains, Mt. Pollock Landscape Guardians and the Barrabool Hills Landscape Guardians. Tony Hodgson, a third Director, helped fund the anti-Collector-wind-farm campaign in NSW (currently in the planning system) and is involved with the Booroowa Landscape Guardians to stop a $300 million wind farm proposed near Rugby and Booroowa, in NSW’s south. “At all times to establish and maintain complete independence from government, industry and advocacy groups for or against wind turbines”. The Foundation has no physical address in Waubra and, indeed, appears to have no local Waubra resident on its Board. It boasts a “medical director”, Sarah Laurie, living in Crystal Book, South Australia. The address is Box No.1136, South Melbourne, 3205, the same address as that of the Australian Landscape Guardians and Peter Mitchell. Dr. Michael Wooldridge, the former Howard minister is also listed as a Director. WHO ARE THE LANDSCAPE GUARDIANS REALLY? The “Landscape Guardians” are well-known climate sceptics with links to the Liberal Party and the Institute of Public Affairs. The have a particularly close association with the IPA’s own astroturfer, the Australian Environment Foundation, which is more interested in tree-logging than tree-hugging. Why would the Guardians contrive to fool the public into thinking this was an independent organisation; an important-sounding “Foundation” no less? Interestingly, the Waubra Foundation appears unconcerned about the aesthetics of wind farms. Its sole agenda is the so-called “infrasound” problems caused by wind turbines. Is the Waubra Foundation a strategic “front” for the Guardians to gain a place at the table amongst the “medical experts” whenever there is a public debate on health issues relating to wind farms? Peter Mitchell has had first hand experience with wind farms. As owner of the historic property, Mawallock, he successfully objected to the number of turbines proposed for the Stockyard Hill wind farm near Beaufort, Victoria. He also managed to have them removed from the ridge overlooked by his property. As residents can successfully object to the number and siting of turbines during the planning process, no government is likely to be worried about a possible future legal suit. 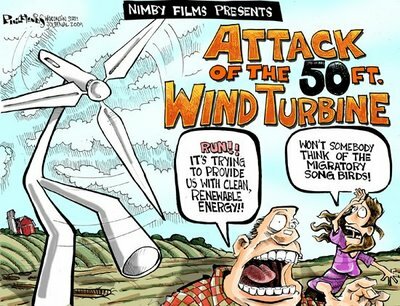 But an aggressive campaign to convince locals they have “Wind Turbine Syndrome” could result in a future class action. Just as the unscientific propaganda pumped out by the climate sceptics is endorsed by a number of Coalition politicians, a scare campaign based on equally unscientific medical mumbo-jumbo would grab the attention of any conservative State government. what is the motive of the landscape guardians? WHO BENEFITS? Liberal whistleblower and one-time Ministerial adviser to the Howard government, Dr Guy Pearse, revealed that millions of dollars from Big Carbon were laundered through trusts like the Cormack Foundation to buy Howard’s climate action agenda. Government Plan: stop or delay regulation on polluters. Big Carbon’s Plan: “mine coal, sell coal, repeat until rich”. The Institute of Public Affairs has been spinning the facts on climate change for decades now on behalf of Billiton, Western Mining, Caltex, Esso Australia (a subsidiary of Exxon), Shell and Woodside Petroleum. It also receives funding from the Murdoch press: News Ltd.
Mitchell certainly has interests in the fossil fuel industry. These include founding Chairman of the Moonie Oil Company Ltd. and Chairman or a Director of related companies including Clyde Petroleum plc, Avalon Energy Inc, North Flinders Mines Ltd, Paringa Mining & Exploration plc (most now delisted on the ASX). According to Lowell Resources Funds Management Pty Ltd, Mitchell’s experience is derived from over 25 years’ involvement in companies that explored for, developed and financed gold and base metal mines, oil and gas fields and pipeline systems in Australia and overseas. He is/was Chairman of Lowell Pty Ltd., the ultimate parent company of both Lowell Capital Limited and Lowell Resources Funds Management Pty Ltd, a specialist fund investing in emerging mining & energy companies since taken over by Future Corporation Australia Ltd. There doesn’t appear to be any renewables in the mix. Paul Miskelly who represents both the Australian Landscape Guardians and the Taralga Guardians, worked for Australian Nuclear Science & Technology Organisation (ANSTO) for 32 years and gives talks on nuclear power but I doubt that the Australian Guardians want to shadow their UK cousins in advocating for nuclear, especially after Fukushima. Former Liberal leader, Malcolm Turnbull, is clearly frustrated that the once proud Liberal party, a former advocate for the environment, is now an embarrassment for someone of his intellectual abilities. He urged his party to stop listening to climate change deniers, calling on members to defend the science of climate change and pledge to reduce Australia’s emissions. Delivering the Virginia Chadwick memorial lecture in Sydney last Thursday night, he said a war was being waged on scientists by “those opposed to taking action to cut emissions, many because it does not suit their own financial interests”. Climate scepticism (usually translated into “support for Big Carbon”) is a monotonous litany of the Guardians. “…claims the Earth is warming are scientifically unreliable, and the idea of man-made climate change is headed for the “Y2K dustbin”. What hogwash! We don’t see the Landscape Guardians campaigning alongside Lock the Gate, the NSW Farmers Federation and the Greens to halt the destruction of some of the best agricultural land in NSW and Queensland by coal seam gas miners. What about a campaign in Victoria following Premier’s Baillieu’s announcement to re-open Victoria to brown coal mining? Farmers in the most prized agricultural land in Victoria’s Gippsland now face losing their farms to brown coal miners. Is an ugly open cut coalmine preferable to a wind farm where vital food production can continue? There are plenty of photos of contented cows grazing under turbines. Like the Landscape Guardians, the Waubra Foundation is highly secretive. There is no information about its funding or sponsorship. At least it provides contact telephone numbers, unlike the Guardians. Several people I know have tried to contact the Guardians. There are neither listed phone numbers nor physical addresses. They use the classic “astroturfer’s” blind: a contact box which then links to a secret email address. Having sent several messages asking to attend their next “community” meeting, no response was forthcoming. Money seems to be no object: slick websites, full time campaigners, an advertising budget, traveling expenses and a media monitoring service. A genuine community group is proud of its fundraising activities and gives prominence to their sponsors on their websites, along with minutes of meetings and contact details. Ergo: a genuine community group is transparent. There are plenty of wealthy “Guardians” who could be funding this campaign. Charlie Arnott of the Arnott biscuit family is the spokesman for the Boorowa Landscape Guardians. His family property is in the Booroowa region in NSW south where a $300 million wind farm is being proposed. The energy company, Epuron, wants to build between 80 and 110 turbines on a site at Rye Park which are expected to generate enough power for 90,000 homes. The district of Yass has arguably been targeted for a larger proportion of wind farms than elsewhere in Australia. These are planned at Bango, 25 km north of Yass, Birrema, 30 km west of Yass, Rye Park (mentioned above), 25km north-north-east of Yass and the Yass Valley itself with wind farms at Carolls Ridge, Conroys, Gap, Coppabella Hills and Marilba Hills. No other media in Australia has run a more distorted and dishonest scare campaign about wind farms than the Murdoch media. Locals in the Boorowa region believe that a secret meeting was held at the Arnott property to discuss funding for the Booroowa Landscape Guardians. Tony Hodgson of Waubra Foundation was there along with members of Arnotts family. No problem with this but, again, why the secrecy? Shining a light on the Guardian’s murky funding pool is a challenge. As incorporated bodies, they are required to submit an annual audited financial statement. Having checked several of these, I can vouch that they claim zero income and zero expenditure! Why the cover up? Whose money are they trying to hide? Perhaps they are hiding the fact that many of these supposedly independent Guardian groups we’ve seen mushroom around the countryside are “bogus“ community groups” hatched in some office in, say, South Melbourne, to create the impression of a widespread community uprising. There are around 26 listed Guardian “groups” in Australia having spread from Victoria to NSW, then Queensland and now South Australia. What a little cross referencing will reveal is that there is a core cabal of people whose names pop up time and time again as office bearer or representative of either the “Molongo”, “McHarg”, Spa Country” or “NSW” Landscape Guardians and so on. The trick with astroturfers is to create a large number of so-called community groups to gain disproportionate media attention. Further investigation often finds these to be “phantom” organisations of just one person with often the same person representing multiple groups – as, indeed, we have already seen. Whether they are all run from a central office is hard to tell since no-one has discovered the whereabouts of the Guardians’ bunker. The Guardians’ modus operandi is simple and devastatingly effective. At the mere sniff of a proposed wind farm, media releases go out from “local” Landscape Guardian groups. Paid advertisements call for public meetings. At these, the forces behind the climate sceptic movement in Australia, such as the Institute of Public Affairs’ Australian Environment Foundation, call on the by now familiar list of Guardians and its plentiful supporters amongst the Lavoisier Group, the Liberal Party and other sceptic groups to be bussed in. With the emphasis on silencing any pro-wind supporters at a meeting, these undoubtedly include some of the uglier mobster element we saw at the anti-carbon rally in Canberra. The recent Yass meeting was a good example. As public meetings went, it was a “set up”. No industry representatives were invited or anyone to speak “for” wind farms. The draw card was Sarah Laurie with her scary medical “evidence” swallowed by credulous members of the public because of her GP “badge of authority”. Unfairly, no mention was made that Dr. Laurie is neither a practicing nor registered GP and, as such, has no obligation to observe the GP’s medical code of ethics. Unsurprisingly, again, it appears that the “locals” were outnumbered 3 to 1 by trucked-in anti-wind Guardians and their fellow climate sceptics. Last year, Family First’s own climate sceptic (and believer in Creationism: see video below) Senator Steve Fielding initiated a Senate enquiry into so-called ‘turbine sickness’. The report was released last month. During the evidence to the Senate by Chairman of Hepburn Wind, Simon Holmes a Court, he told of his invitation by the Moorabool council to talk at a town meeting on two wind farm proposals. He was one of the four who spoke in favour of wind energy, amongst an aggressive crowd of more than 200. Whilst moved by the negative experiences of the few who came with genuine concerns, he was disgusted by the thuggish behaviour of those who verbally and physically intimated those identified and pointed out as “windies”. It reminded him of the Salem witch trials. Holmes a Court submitted the following email running sheet which he described as being from “one extremist group to another”. It detailed the strategy for the protest at Leonards Hill, including the signage held by the thug-like rent-a-crowd which Holmes a Court captured in a photo. It was an ugly protest, just like the Canberra one. Cars were beaten with placards and shaken. His children heard a man yell, ‘I hope you all die of cancer’. A woman who had been a pillar of the local community was “stood over as the vile words were spat into her face, ‘F*** off back to Melbourne you sanctimonious middle-class c***’. Welcome to Scepticland. Hello Landscape Guardians and supporters, I have received various emails in the last few days regarding the planned protest at Leonards Hill this Friday at 10.30am, prompting me to speak with Kathy Russell and Jan Perry today about the event. Jan and others have been working hard to prepare for Friday and we have been asked to assist where we can. Following recent discussions with Peter Mitchell and Randall Bell we are keen to expose the flawed basis for wind power policy in Victoria ahead of the state election and Friday’s event is likely to help in that regard. We have posted a number of articles critical of wind power on our website over the last few months including Kathy’s recent excellent article. Jan has been preparing the very large sign she intends to peg out on Andrew Coker’s property on Bullarto Road prior to Friday. The plan is to assemble at the front of Andrew’s property at about 9.30am and move to near the gateway the Premier will use shortly afterwards. I will bring with me 50 pre-printed corflute signs [see attached files] for those that do not have signs to bring. The more signs the better. I will also bring a four metre long banner the Premier will not be happy with, but any media present should enjoy. Jan and I will be doing our best to get any media coverage we can to optimise everybody’s efforts. As others have already said in previous emails we need to make the most of this opportunity to send a message to the government as they are obviously not listening and are not concerned about rural communities. We also need to support each and every community that is threatened by these projects. We either all swim together or we will drown separately. We look forward to your commitment of a couple of hours on Friday. According to Kate Redwood, a Director of Hepburn Wind, most of the protestors who turned up at the groundbreaking ceremony for Hepburn Wind were from outside the area. Extremists in the sceptic’s movement in Australia have sunk to an all time low. Friends in Europe and the UK believe our isolation from the civilised world is a factor. The increasingly nasty underbelly of the sceptic movement is starting to mirror the Tea Party. Climate scientists getting death threats along with politicians. Sceptic shock jocks like Alan Jones calling for Prime Minister Gillard and Bob Brown to be thrown out to sea in chaff bags. What happened to civilised debate in this country? At the Waubra protests, former energy minister Peter Batchelor had his leg slammed in a car door and property was damaged. Everywhere the Landscape Guardians and their supporters go, the scene turns ugly. People are too scared to voice an alternative opinion. So what were the findings of the Senate Enquiry into wind farms? The most balanced analysis (compared to the Murdoch press) was that of Giles Parkinson in the Climate Spectator, the main point being that it found no proof of a direct link between wind farms and the so-called “Wind Turbine Syndrome”. At a seminar on the Future of Wind Power in Australia presented by the Melbourne Energy Institute last Wednesday, I spoke to Peter Seligman, Hon Prof at the Melbourne Energy Institute who also gave evidence to the Inquiry. Peter spent most of his life working on the cochlear implant. He has a PhD in electronic engineering. Few people understand infrasound as he does. Professor Seligman told me that the level of infrasound at the beach is far higher than that from wind farms. Beyond 360 metres, the level of infrasound emitted from a wind-farm, typically between 1 and 20 Hz, is below the ambient levels near a beach and below that in the CBD of a city. On the other hand, we are all subjected to far higher internally self-generated natural infrasound levels which clearly, are not a problem. We don’t hear Sarah Laurie warning us not to go to the beach! Dr Geoff Leventhall, Consultant in Noise Vibration and Acoustics, the UK’s leading expert on low frequency noise, and author of the Defra Report on Low Frequency Noise and its Effects told the Enquiry that the high degree of anxiety and stress in local communities is probably because of the social and economic aspects. It is well documented that symptoms disappear when there is a financial benefit! Psychologists call this “sociogenic” illness. Dr Sarah Laurie’s evidence included that from Nina Pierpoint, an American general practitioner who claims to be an authority on “wind turbine syndrome”. She’s the author of a 2009 self-published book containing descriptions of the health problems of just 10 families (38 people, 21 adults) in five different countries who once lived near wind turbines and who are convinced the turbines made them ill.
With approximately 100,000 turbines around the globe, her sample was declared by medical experts in Australia as being too small to have any scientific value. There were no scientific controls and the symptoms described were common in any community. Dr. Laurie, hellbent on ignoring the opinion of her peers, also tried to appeal against a proposed wind farm at Allandale East in South Australia. With monotonous consistency, the judge there threw out her claims based on the same response from the medical community we’ve heard over and over again about Laurie’s claims. This time, it was Professor Wittert, Professor of Medicine at the University of Adelaide, who declared that there was no credible evidence of a causal link between the physical outputs of a turbine and adverse affects on health. The Climate and Health Alliance’s submission warned the Senate Committee to note the relationship between the Landscape Guardians and their fellow-sceptic group, the Australian Environment Foundation. The evidence against Pierpont’s claims was damning. Psychological and physiological responses to stress were implicated in the development of perceived health effects. These are referred to as the ‘nocebo’ effect – a worsening of mental or physical health based on fear – essentially the opposite of the well known ‘placebo’ effect. The Alliance blamed the negative publicity resulting from the Guardian’s own fear campaign. Nice one! This view was backed by a recent Parliamentary Inquiry into wind farms in NSW which was scathing in its condemnation of Pierpoint particularly since her research findings have not been published in a peer-reviewed journal. The Committee was concerned that a degree of fear was being instilled in communities that may host wind turbines. As a result, this unwarranted fear-mongering might cause greater health impacts than the presence of any actual “Wind Turbine Syndrome”. In its submission to the Senate enquiry, the group, Doctors for the Environment, also agreed that “there is no convincing evidence in the scientific literature of direct physiological effects occurring at sound levels commonly associated with modern wind turbines”. And what of Dr Laurie’s claim of wind farms resulting in “school hating” children? Read the full report by Simon Chapman, Professor of Public Health, University of Sydney here! In conclusion, no-one denies that whilst some people like the look of wind turbines in the countryside, others don’t. That is their right. There is no doubt that some people living close to wind farms have genuine complaints about noise. Community consultation could certainly have been better. But with the media helping to whip up a frenzy of negative sentiment throughout the community, it is hard to cut through with the positives about wind farms. At the wind seminar, Ken McAlpine from Vestas said that the scare campaign by the Landscape Guardians put the anti-fluoride and anti-vaccination scaremongers in the shade. Emily Wood from Pacific Hydro told me that the Codrington Wind Farm, built in 2001 before the Guardians came onto the scene, had strong support from the community. Bloomberg Energy Finance puts the cost of a new coal-fired power station the same as wind power. Wind farms are now an attractive proposition. The construction of the Waubra Wind Farm provided a one-off boost of $58.4 million to the local economy just through the economic activity associated with the 160 jobs that were sourced locally. Ongoing employment at Waubra adds a further $7.79 million to the local economy each year just from the jobs. These were figures that were generated by the City of Ballarat, using REMPLAN modeling. Also at the seminar, Kate Redwood, Director of Hepburn Wind, outlined the strategy used to secure community support in Daylesford. They are now monitoring noise of those houses within 2km of the turbines. As a result of their success, a new organisation, Embark, has been set up to help advise on the management of community projects. As a result of the Senate Inquiry, monitoring will be continued by public health authorities and the wind industry will continue to improve its modeling and community relations. That’s the deal supported by the wind industry and public health authorities. The Guardians need to step back and consider the ethics of spreading unscientific mumbo jumbo and creating unfair hysteria in those communities which will benefit financially from wind farms. The bullyboy tactics and threats to the supporters of wind (including any journalist who dares write even a balanced article on wind) need to be seen for what it is: un-Australian! Pseudo-Tea Party tactics will ultimately turn decent Australians off. Facts have a way of emerging through the mud raked over by those who would bury them. People will wonder why with over 100,000 turbines around the world, there has been no World Health Organisation, no National Academy of Science, no recognized medical journal, not even a vet report supporting the Guardians’ views. They’ll also question the credibility of a small but powerful group who are the same people making preposterous claims about climate science.